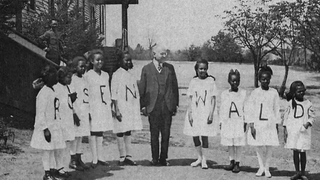 Julius Rosenwald stands with black American students who attended one of over 5,000 schools he built for African-American students in the 20th century. In the trailer for the documentary Rosenwald, civil rights activist and U.S. Rep. John Lewis (D-Ga.) describes the type of school he went to as a child. "It was a little school a short distance from my home—walking distance. Beautiful little building. It was a Rosenwald school. It was the only school we had," Lewis said. A Rosenwald school—named after Julius Rosenwald, a 20th-century Jewish philanthropist who made his fortune by co-founding the department store we refer to today as Sears. The trailer, released exclusively by The Root, describes how Rosenwald was a relentless businessman but was also deeply inspired by the works and racial-equality teachings of Booker T. Washington. Or, more specifically, Washington's emphasis on what a solid education could do for the racially disadvantaged in America. So much so that Rosenwald teamed up with Washington, and together they hatched a plan to build over 5,000 schools for black students in the Jim Crow South. It was a pretty important endeavor, since segregation prohibited blacks from attending the all-white schools in many Southern states. The late poet Maya Angelou appears in the documentary, which is slated to be released in New York Aug. 14, and the rest of the nation throughout the fall. Angelou spoke about one of the schools she attended as a child, a school that was also built by Rosenwald. "I thought my school was grand. It was the Lafayette County Training School," Angelou said. "It's a wonderful story of cooperation between this philanthropist, who did not have to care about black people but who did, and who expended his considerable wealth in ensuring that they got their fair shake in America," Bonds said. Other notable African Americans who are Rosenwald alum include Tony Award-winning playwright George Wolfe, attorney and academic Anita Hill, and Pulitzer Prize winner and Washington Post columnist Eugene Robinson.